Cut chicken into bite size pieces. Soak them in "TERIYAKI SAUCE" for 25 minutes. Spread aluminium foil in the oven, cook the chikin on it at 200 degrees for 7 or 8 minutes. Cut the pineapple in about the same size as the cut chicken. 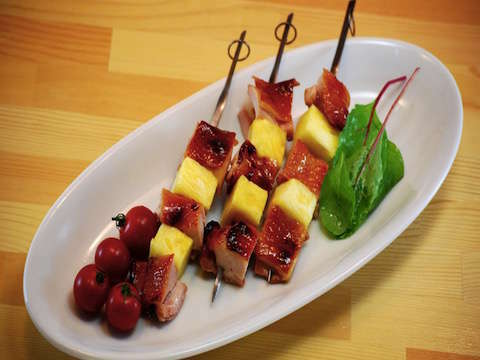 Skewer the chiken and the pinapple.